If you are involved with teaching children, then the following resources will help you prepare for your time together... and pull a lesson together quickly when the rostered teacher is suddenly sick! 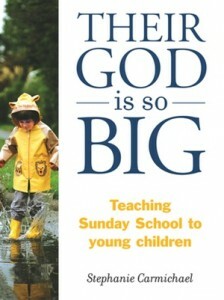 Their God is So Big is a unique and indispensable guide to teaching Sunday School to young children (up to the age of eight). It covers everything from understanding the kind of person you should be as a teacher to comprehending the rapidly changing stages through which children pass. Teaching Little Ones is a superb Bible-based curriculum for young children in your Sunday School or Kid’s church. The syllabus provides six years worth of material for 3-8 year olds, and contains everything you’ll need for one creating and teaching compelling lessons—including lesson plans, story scripts, action rhymes, prayers, activities and craft ideas. You won’t have to worry about recurring licence fees or buying workbooks—all the material is available as PDFs, so that you can distribute individual lessons to teachers via email, allowing them to prepare in advance and print off only the sheets they need. 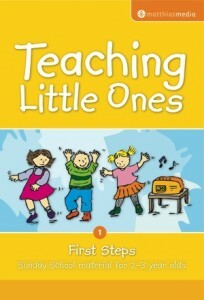 First Steps is module 1 of the Teaching Little Ones curriculum, and provides one year’s worth of material for 2–3 year olds. 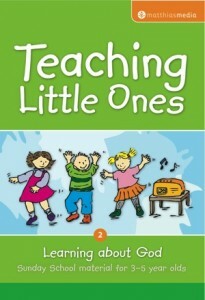 Learning about God is module 2 of the Teaching Little Ones curriculum, and provides one year’s worth of material for 3–4 year olds. Introducing the Bible is module 3 of the Teaching Little Ones curriculum, and provides one year’s worth of material for 4–5 year olds. Promises is module 4 of the Teaching Little Ones curriculum, and provides one year’s worth of material for 5–8 year olds. Kingship is module 5 of the Teaching Little Ones curriculum, and provides one year’s worth of material for 5–8 year olds. 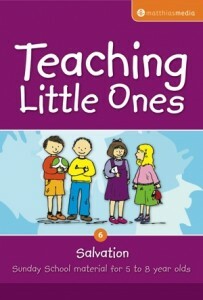 Salvation is module 6 of the Teaching Little Ones curriculum, and provides one year’s worth of material for 5–8 year olds.